Yes! It's cold. And, yes, I am grilling. Grab a jacket and join the Polar Bear Barbeque Club. It's really not that bad, and the food sure tastes great. Tonight I'm grilling a pork loin on my small travel Weber. The big Weber is next door, and well . . . you know. The last time I got a pork loin, my son wanted to know if it was the pig's leg. Guess I need to get him outside and learning more about barbecue. A visit to a farm might be in order too. 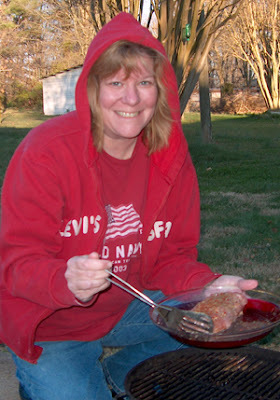 If I ever make BBQ pigs leg, I will take pictures and let everyone know. Hi! Great topic, congratulations for the blog too! Thanks for stopping by. I'm enjoying the blog.